For the next round, out of 17,911 candidates, 642 will be shortlisted based on their score and 'Sunny Leone' is one of the contenders for the government job. 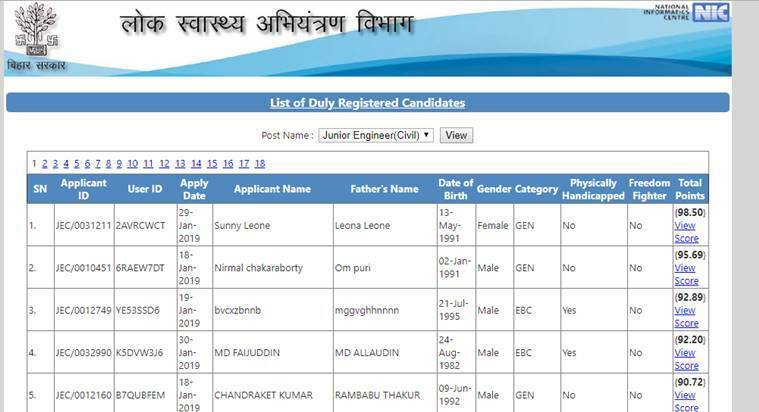 Bihar Junior Engineer exam: The Public Health Engineering Department (PHED), Bihar has released a provisional merit list of candidates for the recruitment over the post of junior engineer (JE) yesterday on its official website, phed.bih.nic.in. According to the list, the maximum marks are obtained by a candidate named Sunny Leone. Leone, according to the official release by the department, is a 27-year-old single woman with five years of work experience. Her father is Leona Leone and she belongs to the unreserved category. The applicant has obtained 73.50 points based on her academic record and full marks of 25 points based on her experience. The total of the two makes her top the merit list with 98.50 score. A total of 17,911 candidates had registered for the exam and marks of each one of them have been displayed online. A total of 214 vacancies are to be filled by the recruitment exam. For the next round, 642 candidates (thrice the number of vacancies) will be shortlisted based on their score and ‘Sunny Leone’ is one of the contenders for the government exam. The shortlisted candidates will have to produce documents to justify the information as displayed in the list, wherein, the department according to Kumar will eliminate such ‘miscreants’. Apart from Sunny Leone, another candidate named, ‘bvcxzbnnb’, has also made it to the top third rank of the link. Meanwhile, the department has given a window to candidates to correct the information provided in their application. The correction window is open till February 24, 2019.